Last monday I bought an Acer Aspire One, 8.9', with an extra 6-cell battery and 15 minutes later I installed Ubuntu (Netbook Remix version) on it, and after realizing everything was working smoothly (except for the SD card reader... anyway, I have an external device for doing so) I installed the Fluxbox window manager. New: You may also be interested in Two weeks: still loving Fluxbox. 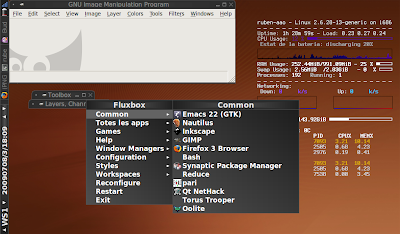 Here you can see the FluxBox Root menu, Conky in the "desktop"